I was looking for something and I found something, so I guess I was somewhat successful. My search was for an uncommon small brown butterfly known as Henry’s Elfin. 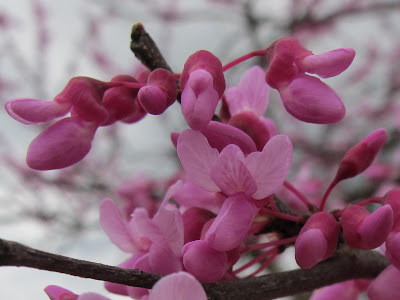 Henry’s Elfin lays its eggs among the blooms of the Redbud, so the best time to see them is at the peak of the Redbud blooming season which happens to be right now. I managed to see several small butterflies on the Redbud flowers, but they were all Olive Hairstreaks as shown in the photo. Olive Hairstreaks are also an uncommon species, so even though they weren’t my desired find, I was happy to see them. Several factors increased the difficulty of my search. 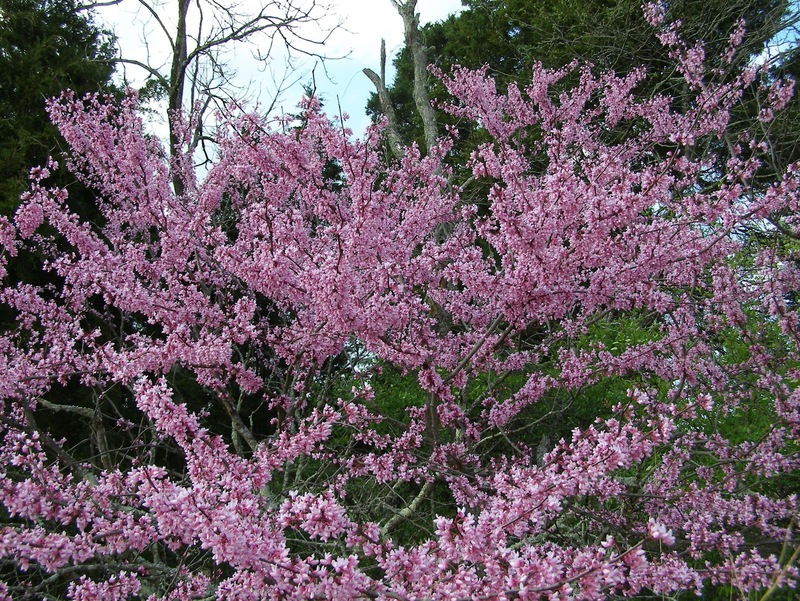 One was the sheer volume of Redbud blooms. Every branch of every Redbud tree is crowded with flowers, so the butterflies could be anywhere. This abundance may result in a larger than average Henry’s Elfin population next year. 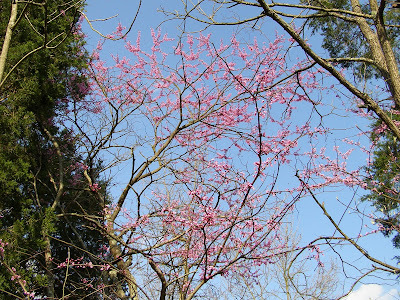 Most of that profusion of Redbud blooms is above my head. I’ve seen several small butterflies moving in the tree tops. Unfortunately, I can’t confirm any of those as being Henry’s Elfin. 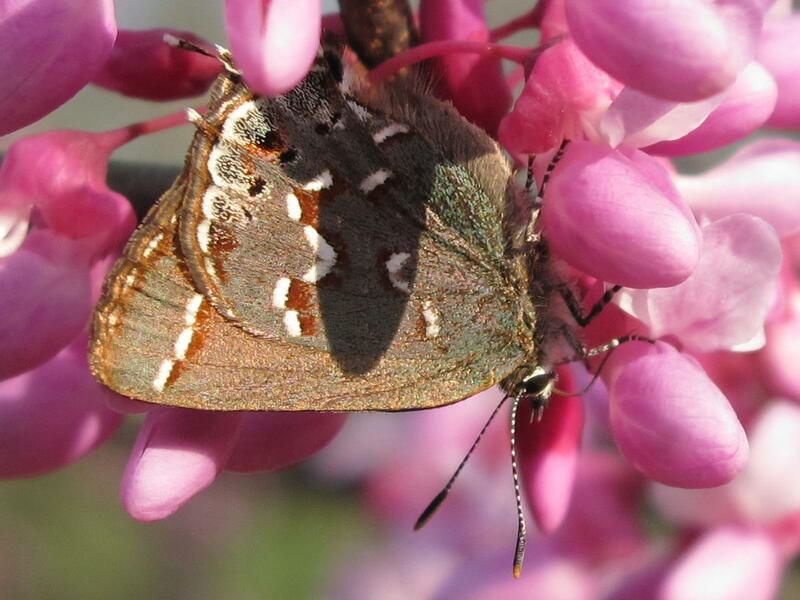 The Olive Hairstreak may display some bright colors on its lower wing surface, but the upper surface is brown. In flight, especially when viewed against a bright sky, the Olive Hairstreak looks brown, so I may have been seeing more of that species. Butterflies were far outnumbered by foraging Bumblebees. It’s easy for a small butterfly to go unnoticed among the ever moving Bumblebee traffic. 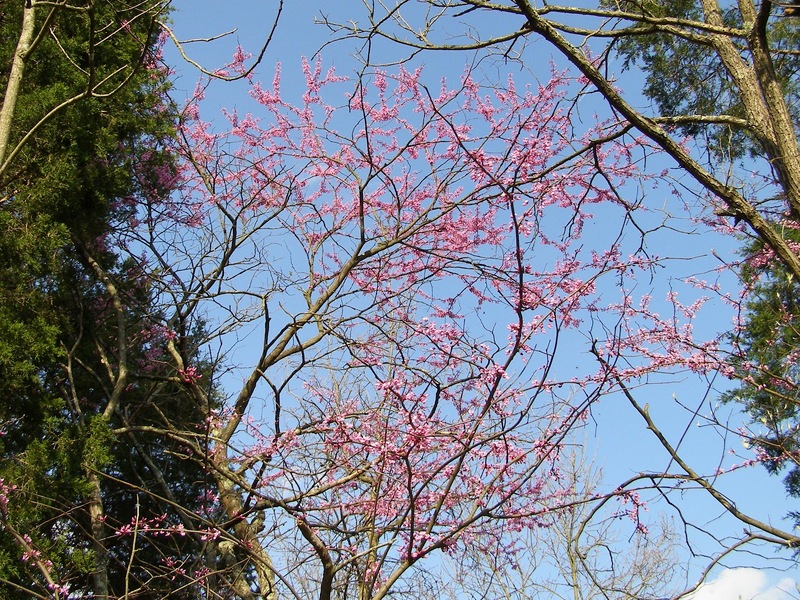 The other consideration is the fact that I’ve never before seen a Henry’s Elfin adult on a Redbud. I know adults have been there, because I’ve found larvae on Redbuds. Every Henry’s Elfin I’ve ever found has been resting on the dead stalks of tall Prairie Grasses. 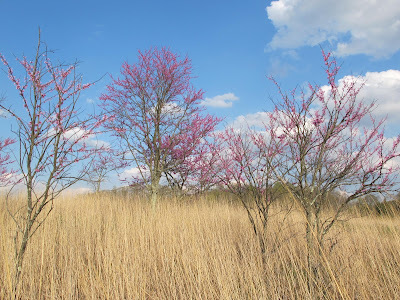 In an effort to help the Henry’s Elfin population, I favor Redbuds in my management efforts and maintain that tree in large sections of the field edges. 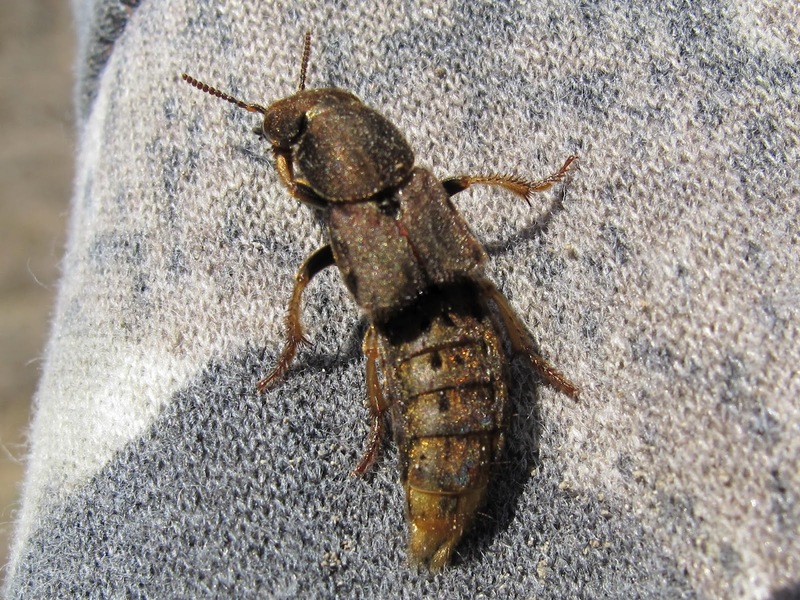 I can’t help thinking that there’s some connection between the Henry’s Elfin and the Xeric Limestone Prairie found at Blue Jay Barrens. 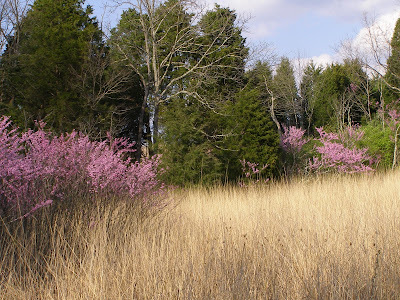 For that reason, I maintain some Redbuds out in the Indian Grass fields. I don’t know if that helps, but the Henry’s Elfins are very plentiful in some years. I’ll keep looking for the Henry’s Elfin. It may be that they have not yet emerged. 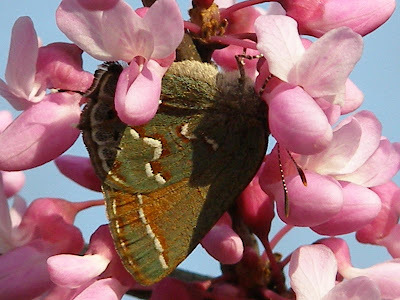 In the mean time, I’ll enjoy the Olive Hairstreaks. If you believe my search is doomed to failure, you can go back to an earlier post to get a look at a Henry’s Elfin. 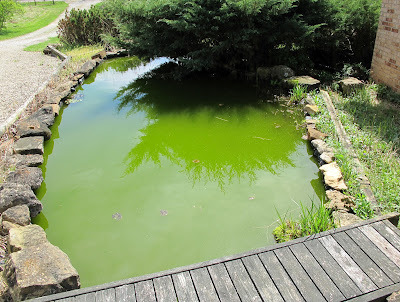 The Water Garden made it through the winter with no change in the level of planktonic algae that makes the water green. The water normally cannot go more than a few weeks in this condition before something emerges to eat the algae. 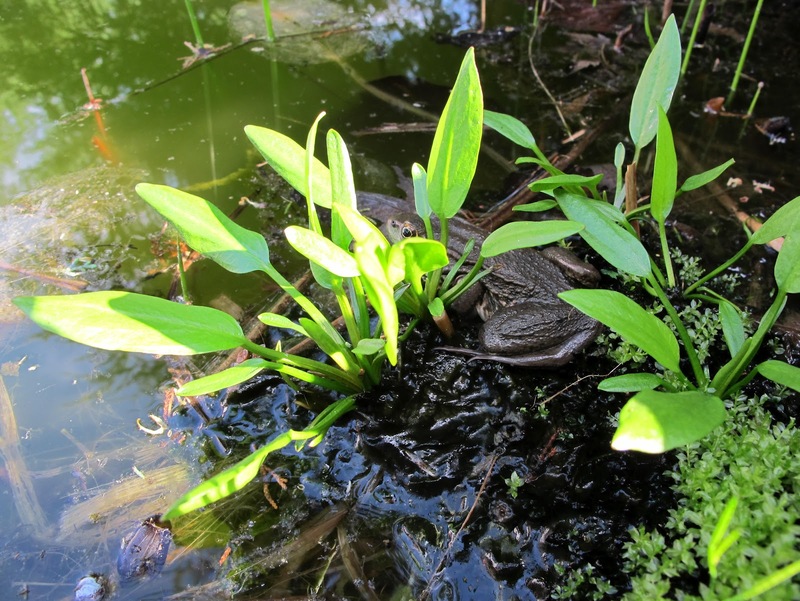 Several clusters of Wood Frog eggs hatched in the Water Garden, so we’ll see just how effective those tadpoles are at filtering the water. 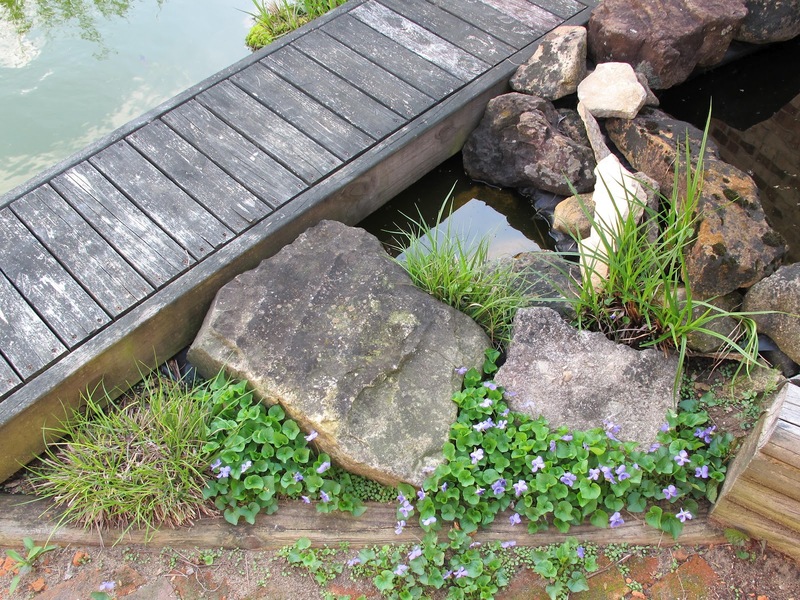 When the Water Garden was first established, I used several pots to create areas for the growth of shallow water plants. Small-flowered Water Plantain was one plant that I brought in from the pond. 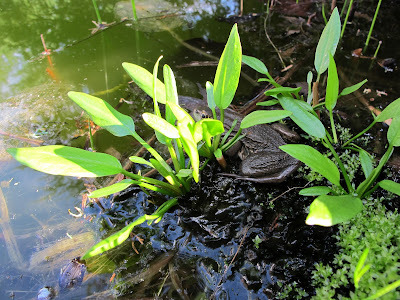 It has since died out from the pond, but is expanding its population in the Water Garden. 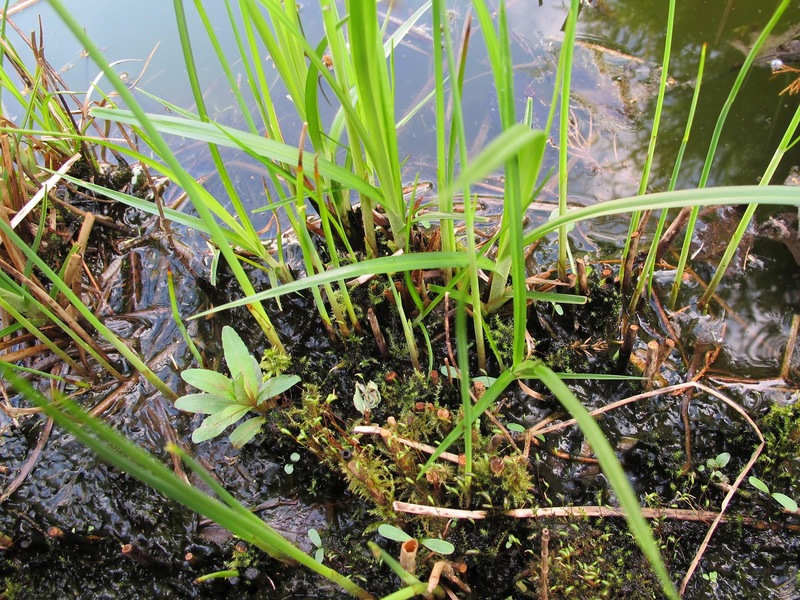 Several other plants have entered the Water Garden as volunteers. Bulrushes have claimed much of the shallow water area. The plant composition continues to diversify. The pots were originally completely submerged. 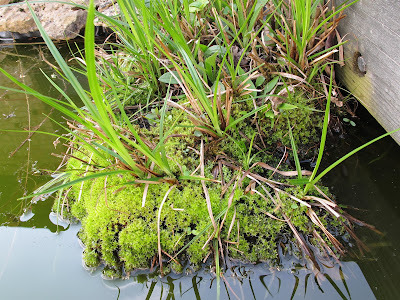 Decomposing plant material has since built up the soil to a level a couple of inches above the waterline. The mass of mosses and plant roots has created a floating island that extends eight inches beyond the edge of the pot. The plant composition in the landscape is constantly changing. I’ve been encouraging native species and in some cases have been fairly successful. 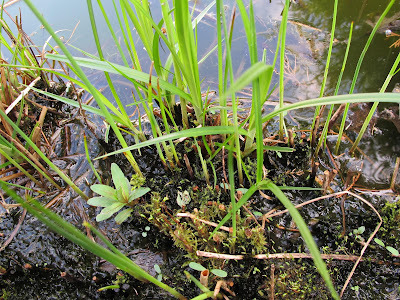 The creek was my primary source of aquatic plant material. I transplanted a small clump of Horsetails to a spot beside the Water Garden and gave it special care during its first year. It survived and flourished to the point of becoming a nuisance. It has just about surrounded the Water Garden and is spreading across the lawn as well as the gravel driveway. It grows in two distinct forms. 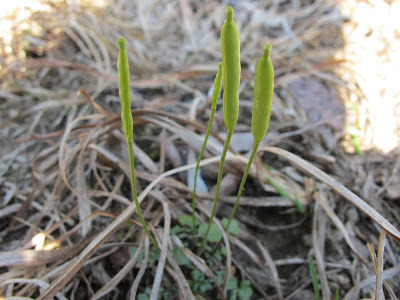 First to appear each year are the fertile stalks that develop a spore producing cone. I’m certainly glad it’s a native. Following the fertile stalks are the sterile stalks. 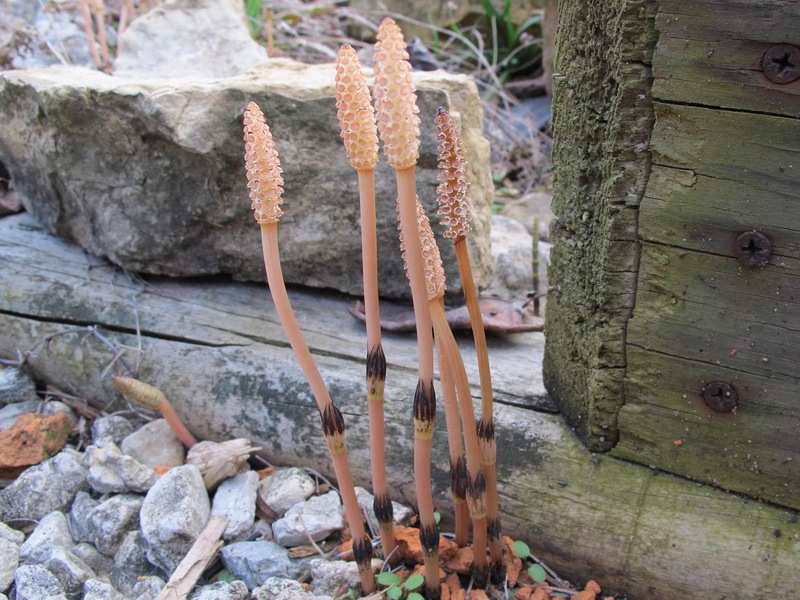 I’ve always loved the look of this plant, probably because I associate it with their prehistoric ancestors living in the Carboniferous swamps. I also introduced a few plants that grow in the floodplain along the creek. 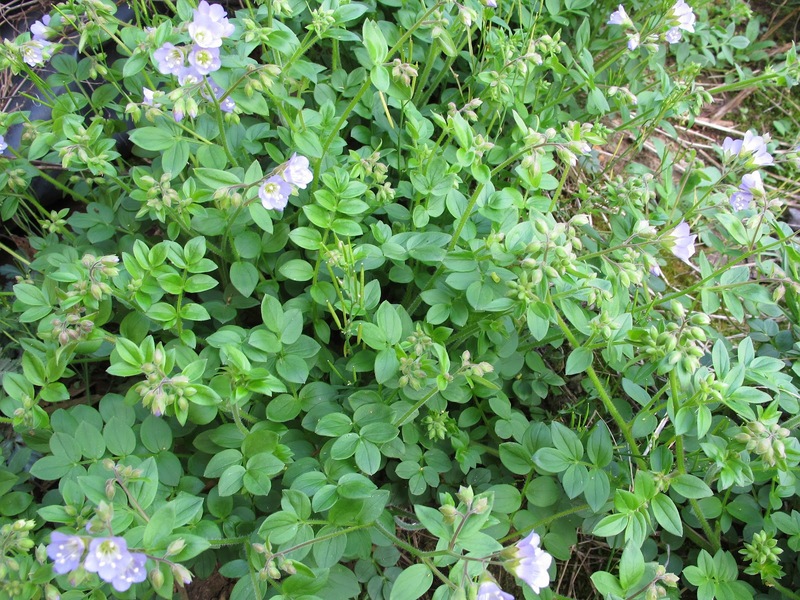 This is Spreading Jacob’s-ladder, Polemonium reptans, AKA Greek Valerian. This is the species with the short stamens as opposed to P. van-bruntiae which as long stamens. Both species are commonly referred to as Jacob’s-ladder in various texts, but everyone seems to have their own opinion of which species properly deserves the name. I’ve heard some pretty heated discussions on the subject that were never satisfactorily resolved, because both sides were right. What ever name you wish to apply, the plant thrives in a garden setting. 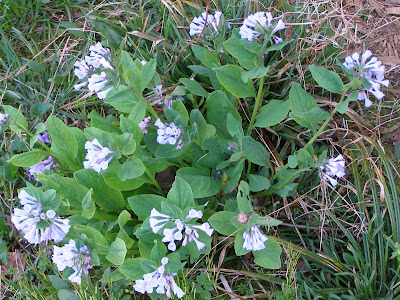 Virginia Bluebells also appreciate the special conditions found in a garden bed. There are still some exotic species crowded in with the natives, but natives gain a little more ground each year. 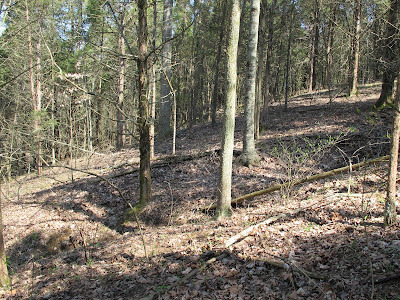 Blue Jay Barrens is not the place to be if you want to see masses of spring wildflowers carpeting the woodland floor. A history of livestock in the woods reduced the wildflower population through trampling and consumption. 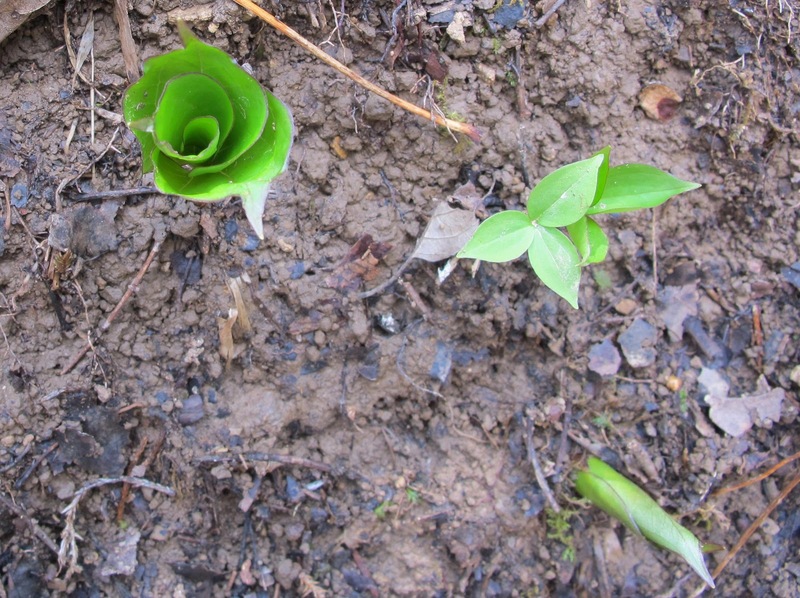 The soil was left eroded and compacted which made it hard for the wildflowers to become reestablished. More recently, deer and turkey have been feeding on many of the wildflowers. 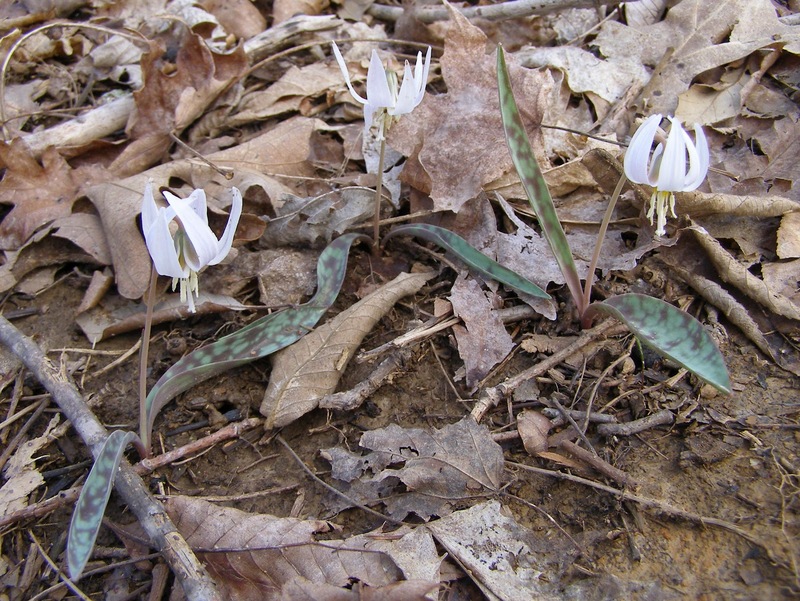 White Trout Lilies are currently the most widely spread species in the woods. 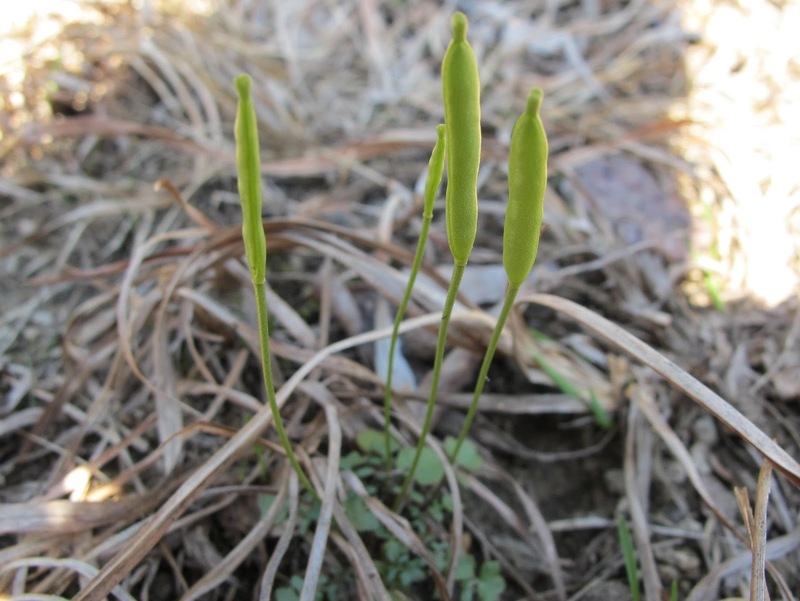 These are growing in an area that was pretty heavily worked over by the turkey flocks. Spring Beauty is one species that is increasing in number. 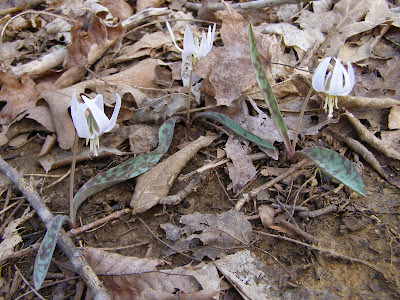 It seems to do best along the woodland edges where sunlight is more readily available. 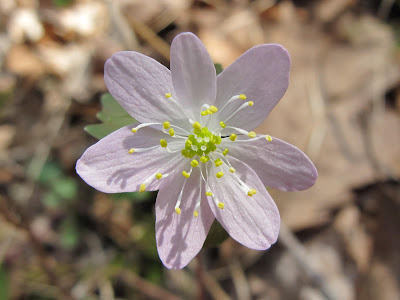 Rue Anemone is common on the lower slopes and floodplains. 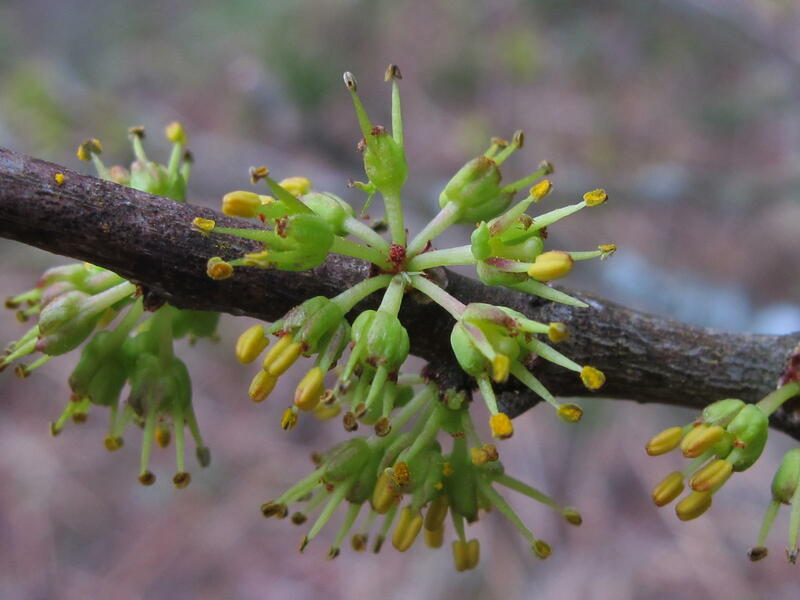 This is always one of the earliest species to bloom each year. The plant moves with the slightest breeze, making it a most frustrating flower to photograph. 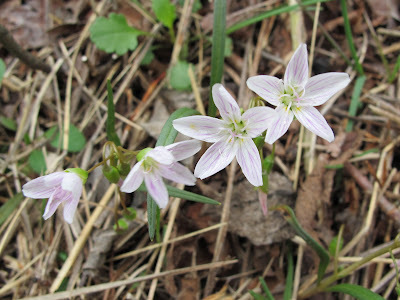 Most of the Blue Jay Barrens woodland wildflowers appear later in the spring. 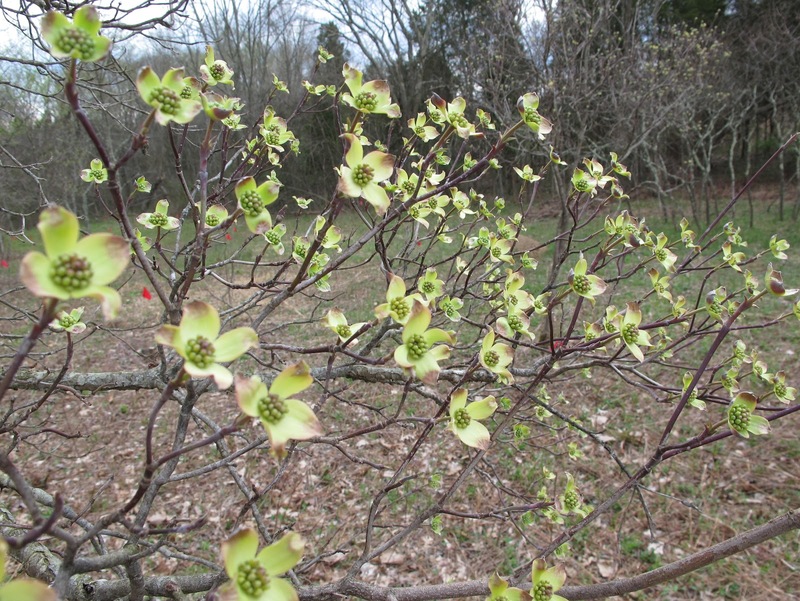 Even when the rest of the State is reporting early blooms, the plants here are slow to awaken. I’m seeing signs of things to come. 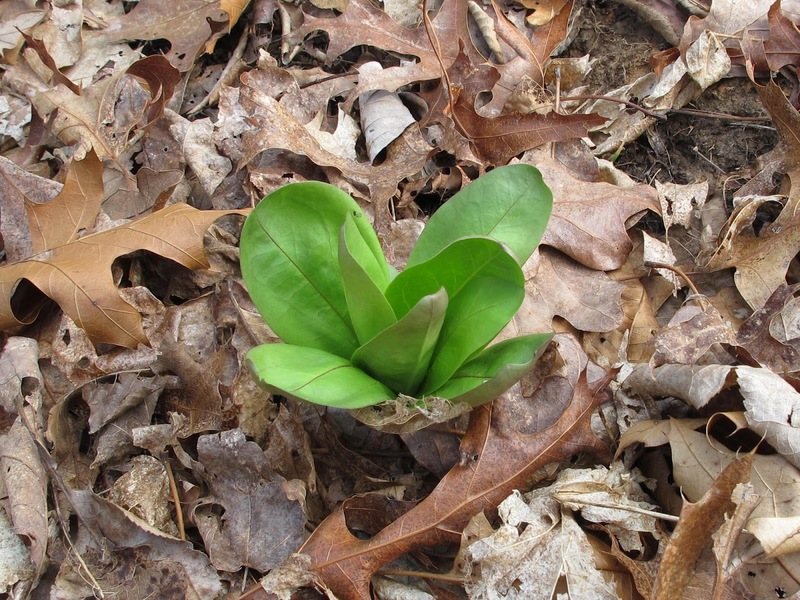 Leaves of the American Columbo are pushing up through the leaves. Columbo flowers won’t appear until early summer. Large Flowered Trilliums are rapidly emerging. The heavy rain that caused the severe flooding earlier in the month also cleared leaf litter from some of the steep hillsides. 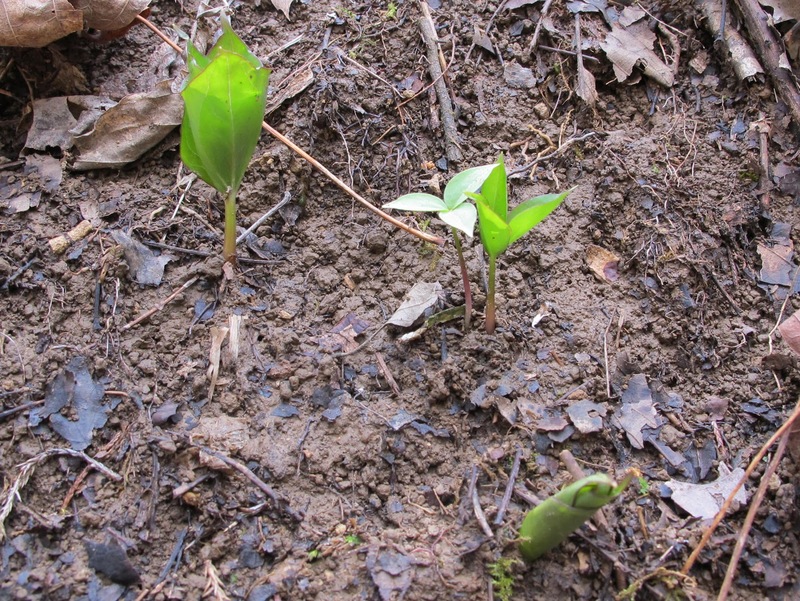 These Trilliums are quite conspicuous growing from the bare ground. 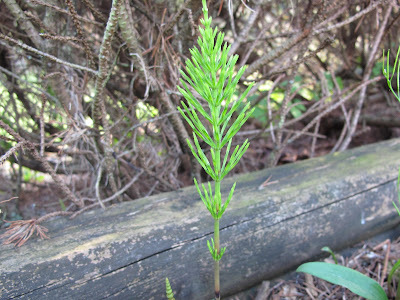 It’s neat how this plant emerges as a spike and then unfurls its leaves after it has some height. 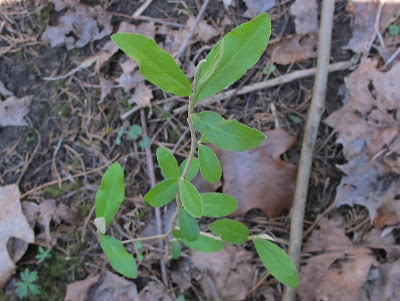 This growth pattern is common with many woodland plants that must push through a covering of leaves to reach the light. One of the first bloomers of the year has already produced fruit. Two weeks ago, Leavenworthia uniflora was just beginning to bloom. Now it’s well on its way to producing ripe seed. Cool weather usually slows the plant’s development so you have a couple of weeks in which to enjoy watching the flowers develop. 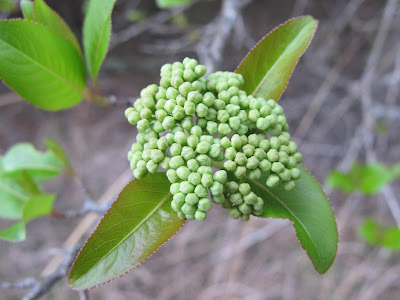 Temperatures in the 80’s caused the plants to flower together and push on to fruit development in just a matter of days. I hope things aren’t going to proceed at such a rapid pace all season. I was enjoying the view from one of the barrens when a gold and brown something came in low from the side and disappeared into the grass a few feet in front of me. Keeping my eye on the spot in the grass, I moved forward and crouched down for a closer look. 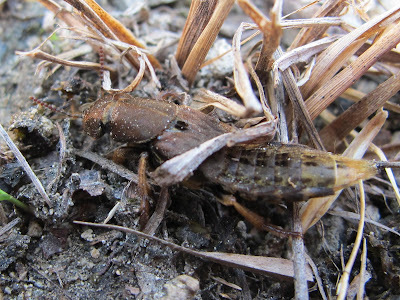 Nothing was immediately obvious, so I got down on my knees and slowly began to move the dead grass leaves out of the way. It wasn’t long before I found part of a body. 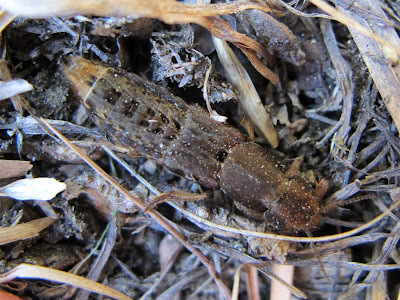 The creature kept burrowing deeper into the grass, but I eventually peeled away enough dead leaves to expose the full body. 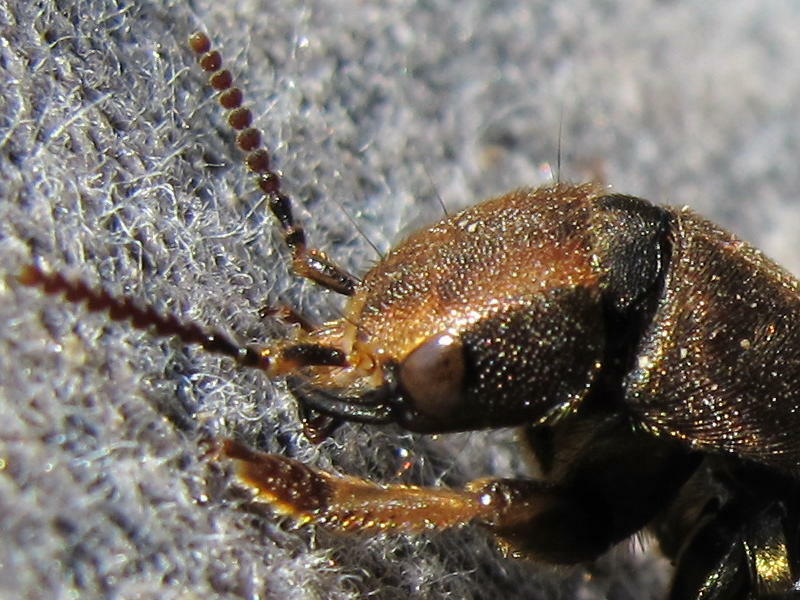 A Rove Beetle, Platydracus maculosus. Of all the possible beetles at Blue Jay Barrens, I just happened to find one I knew. I finally managed to remove enough dead grass to get a good view. After leading me on a short chase through several grass clumps, it now seemed relaxed. 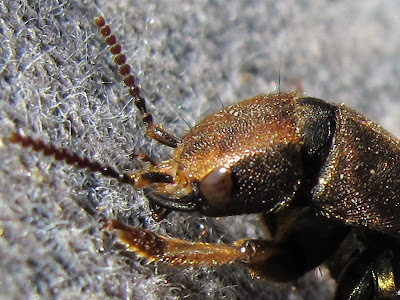 Some Rove Beetles discourage attack by releasing an irritating chemical from the tip of the abdomen. This specimen raised its abdomen several times, but I’m not certain that it’s a species that produces the irritant. The Family of Rove Beetles is easily identified by the short wing covers that leave most of the abdomen exposed. 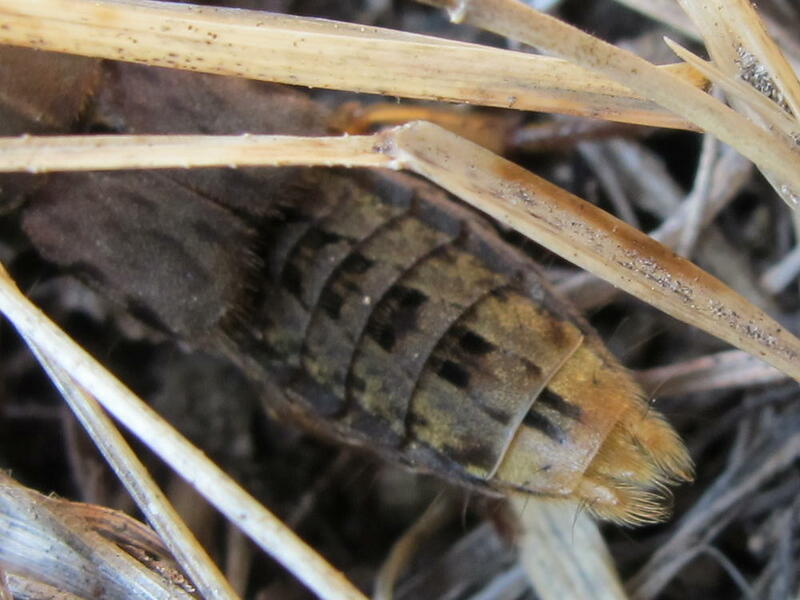 It’s amazing that the beetle is able to fold up a fully functional set of wings beneath those small flaps. 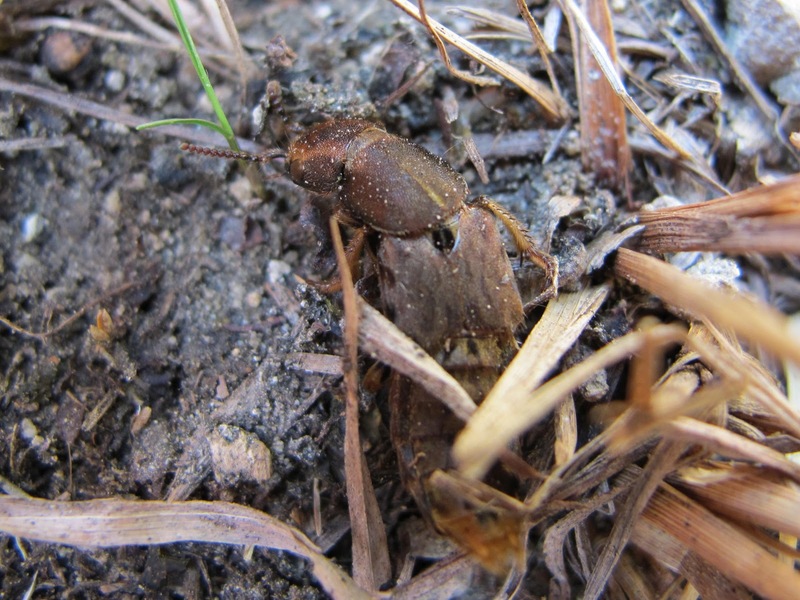 Even when fully exposed, it’s hard to get a good look at the beetle when it’s hugging the ground. Besides the awkward view, it’s covered with dust picked up during the chase. In an attempt to improve viewing, I picked up the beetle. It circled my hand a couple of times and finally settled down after climbing halfway up my sweatshirt sleeve. It spent considerable time cleaning itself. This species is a predator of insects and other small organisms living in carrion, manure or other stinky accumulations of decomposing organic matter. Strong jaws overlap in front of the mouth. This is my first encounter with this species away from its food source. It’s much more pleasant to observe the beetle in this situation than when it’s hunting beneath a bloated Opossum carcass. 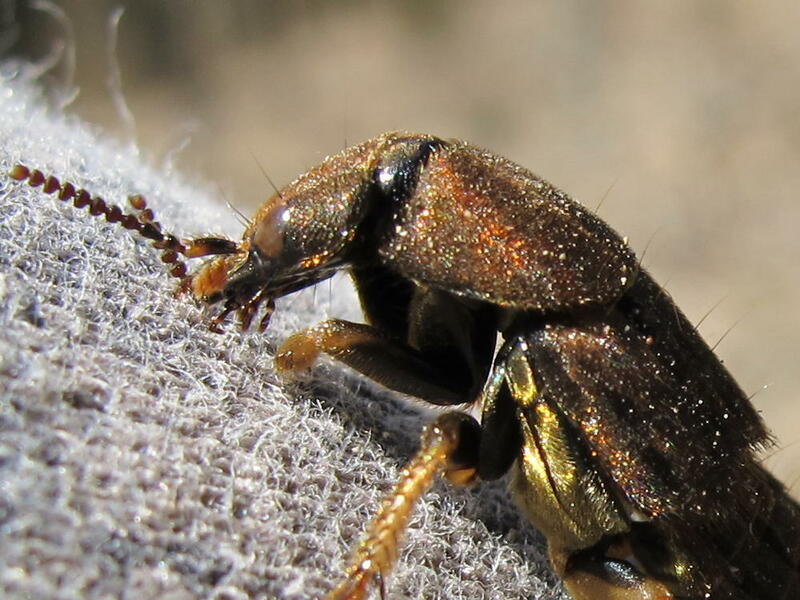 The beetle’s body is full of rich gold, browns and bronzes. Considering where the beetle normally finds its food, I’m not sure it’s a compliment to have this one think my sweatshirt might be harboring something to eat. It may not always appear to be the case, but both the sweatshirt and its occupant are regularly washed. 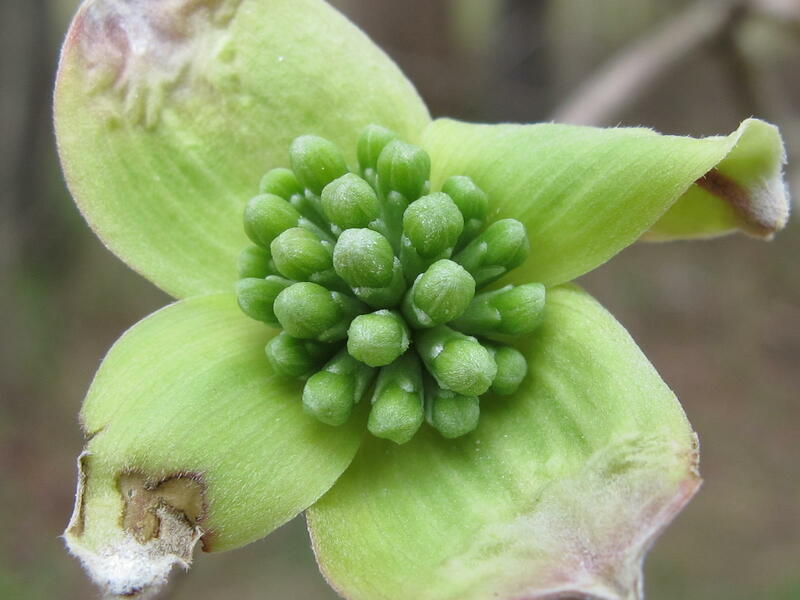 Many of the non-native invasive plants tend to green up early in the year. This aggressive growth habit is part of the reason they are so successful at claiming new territory. By the time most of the native species are beginning to grow, they are already overshadowed by the invasives. This Bush Honeysuckle is a good example of an invasive plant that gets an early start. 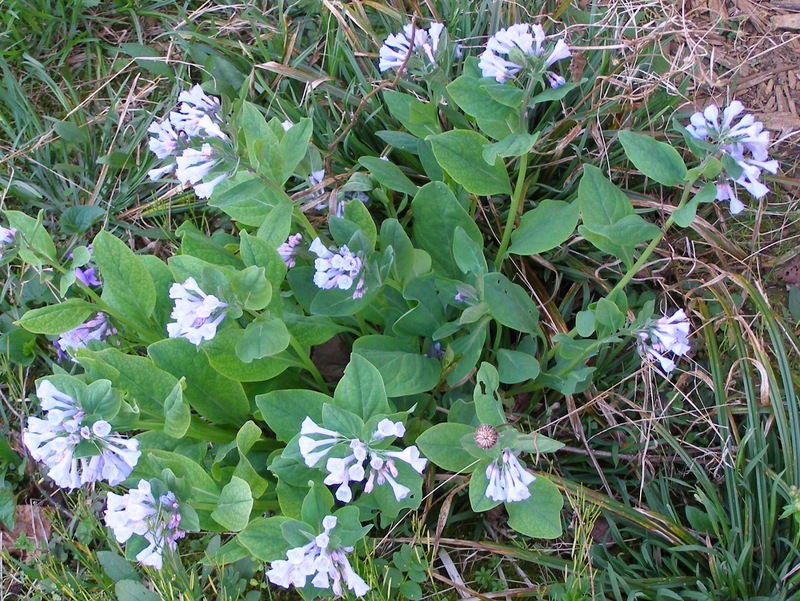 There’s also a disadvantage to being an early greening invasive plant. At least that trait is a disadvantage around here. While out walking, I’m constantly on the alert for those nasty invaders and am instantly attracted to any plant that looks a little too bright green and prosperous. I pull any small Honeysuckles that I happen to find. If you have to deal with Bush Honeysuckle, this is the size to hope for. 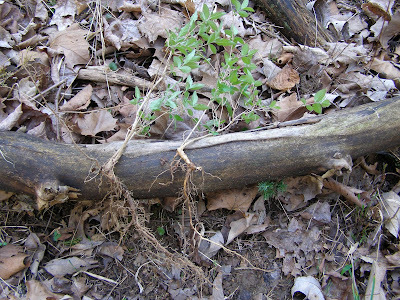 You can easily remove the majority of the root system and the plant will not grow back. 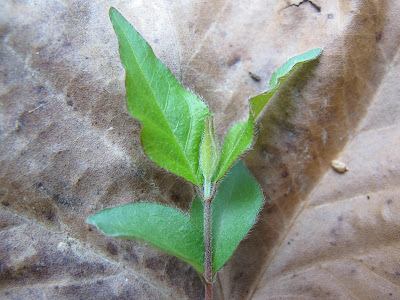 There are several species of Bush Honeysuckle and the leaf characteristics vary slightly between species. They are all invasive. Fortunately they’re distinct enough for easy recognition as a group. In areas that once supported mature Bush Honeysuckle, it’s nice to just deal with the little guys. A one foot tall Honeysuckle has survived to the point where it will easily continue on to maturity, so you can feel confident that you’ve just saved yourself a lot of future work by yanking out the small plant. The Bush Honeysuckle has a shallow root system that offers almost no resistance when you go to pull. The next easiest situation is having no Honeysuckle at all. Little Autumn Olive plants can be given the same treatment. 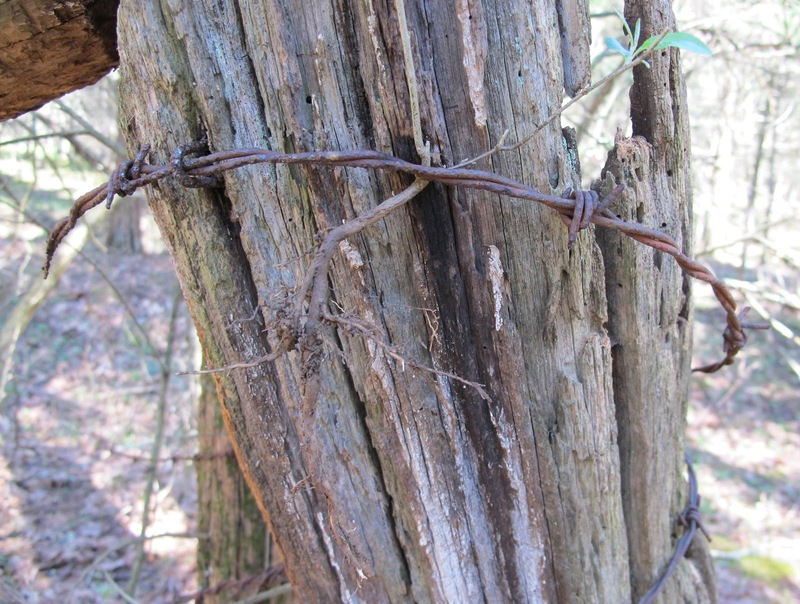 Autumn Olive is a more deeply rooted plant, so it’s a little bit tougher to pull. It also has the ability to regrow from healthy root sections. Fortunately, small plants don’t leave enough root in the ground to make regrowth a problem. Someone recently asked me if there’s a size at which I recommend cutting and treating the plant instead of pulling. There is. 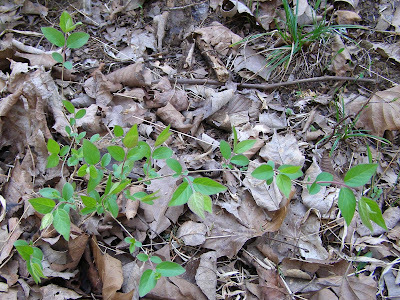 If I pull an invasive shrub as hard as I can and it doesn’t come out of the ground, I then feel it would be more effective to cut the plant and treat it with herbicide. The shrubs at Blue Jay Barrens really took advantage of the week of warm weather we just had. Redbud flower buds were just beginning to color and swell a week ago. Now they’re in full bloom. 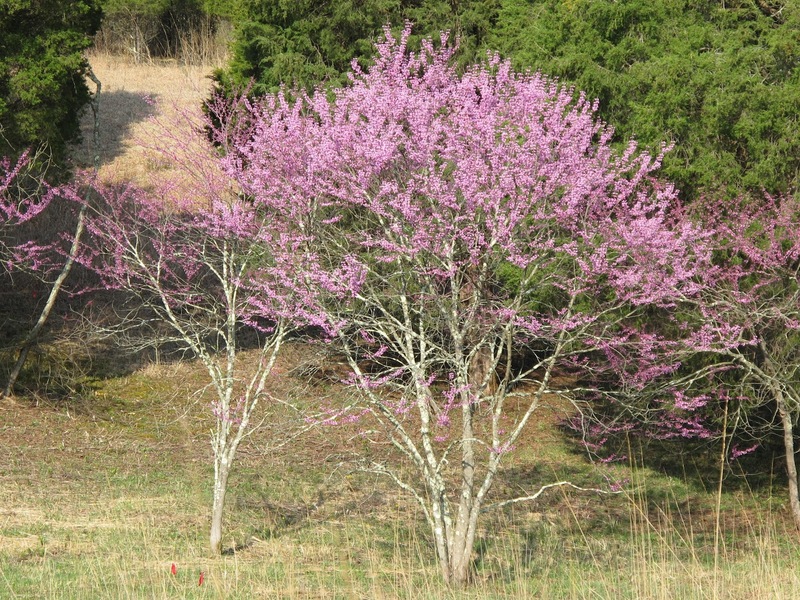 Redbuds are the most colorful of the spring blooming shrubs and are a valuable nectar source for some butterflies and larger bees. The flower shape makes it difficult for many of the smaller insects to access the nectar. 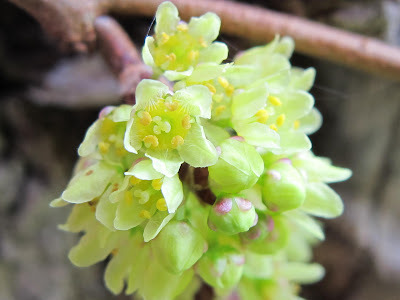 Fragrant Sumac flowers are normally available at the same time as the Redbuds and are much more insect friendly. 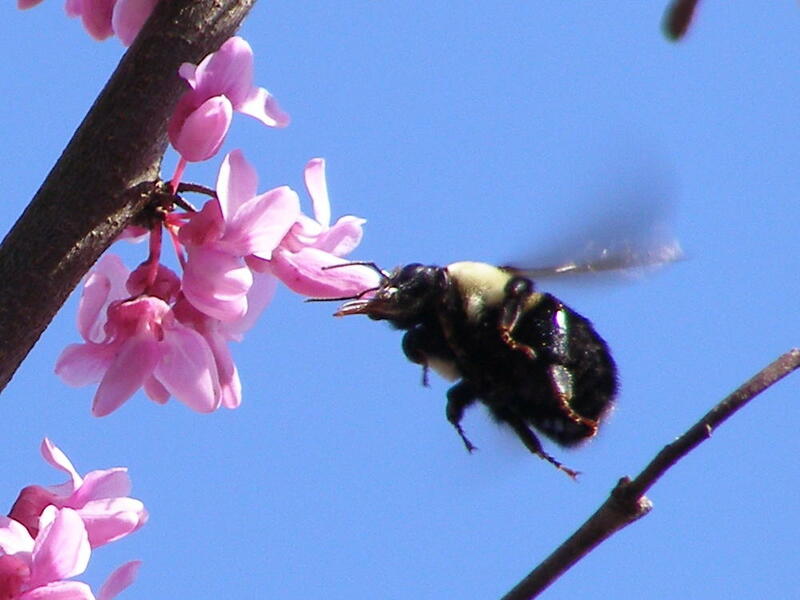 I see a greater diversity of insects visiting these flowers than any other spring blooming plant. 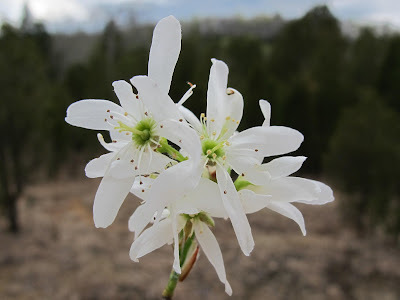 Serviceberry is known for its early blooms, but it’s blooming a full month earlier than it did last year. I’m wondering what will happen to some of these shrubs if we manage to get a hard freeze this spring. Freeze warnings have been posted for Tuesday morning, so I guess we’ll be having the first test really soon. These are Prickly Ash flowers in full bloom. If you get close enough to the bush to see these flowers, you’ll most likely get snagged on one of the many thorns that give Prickly Ash its name. 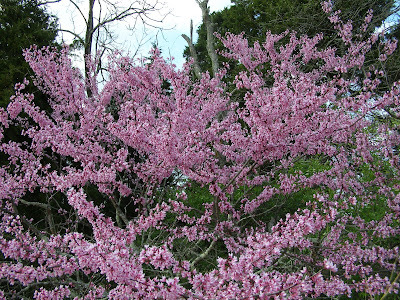 Other shrubs are making rapid progress, but have not yet reached the bloom stage. 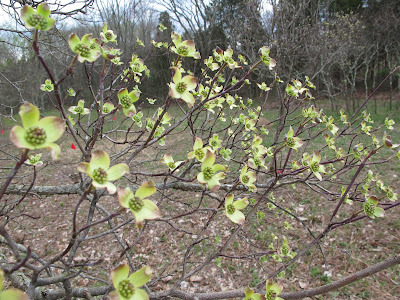 The bracts have folded away from the Flowering Dogwood flower buds. These flowers should be blooming by next week. The bracts will continue to enlarge and lighten in color until they create a brilliant white frame to the cluster of small flowers. The showy bracts are what create the impressive display. Black Haw is producing clusters of flower buds and won’t be far behind the dogwoods in blooming. It seems that spring is rushing past too quickly to enjoy everything. Last year at this time we had only been snowless for a couple of weeks and were enjoying the arrival of more moderate temperatures. This year it feels like we’re already pushing into summer. It’s wonderful having a digital camera handy to capture visual evidence of unusual sightings. 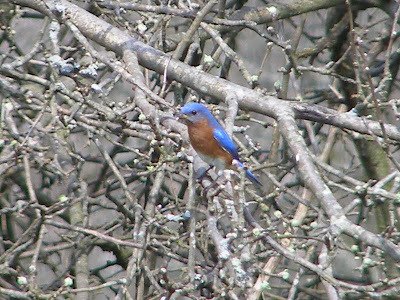 Without a clear photograph, no one would believe that I saw the World’s Longest Bluebird. 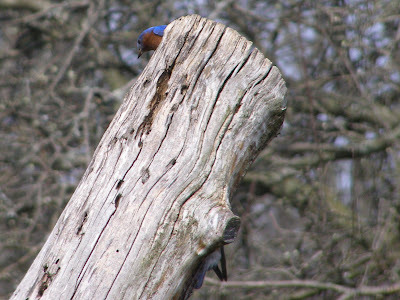 The Bluebird’s head is clearly visible at the top of the stump and there’s no mistaking the authenticity of the Bluebird wing tips and tail showing below. I believe that this specimen tops the typical seven inch individual by at least a foot. This was a remarkable creature to view. I’m only sorry that I couldn’t get a picture of it in flight. 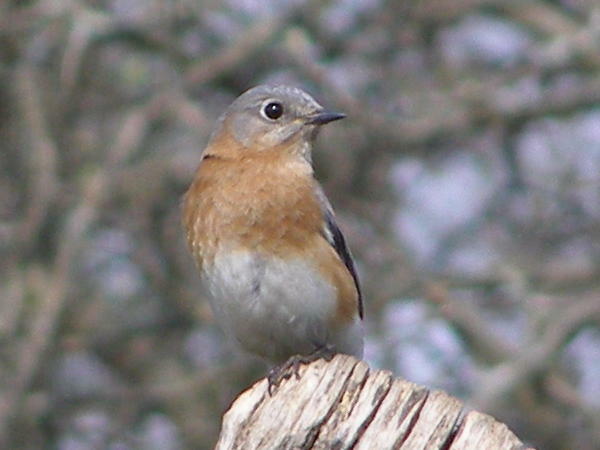 Bluebirds have been abundant this year. I believe the resident birds have been joined by some returning from farther south. Until today, none of them seemed to be unusually elongated. I wouldn’t be surprised if a body of this length required a secondary posterior nerve cluster or brain to control its rear half. Unfortunately, the position of the tree trunk makes it necessary to speculate on the proportions and positioning of body parts on what must obviously be a long, serpentine avian body. Further observation of this unusual specimen proved devastating to my long bird theory. 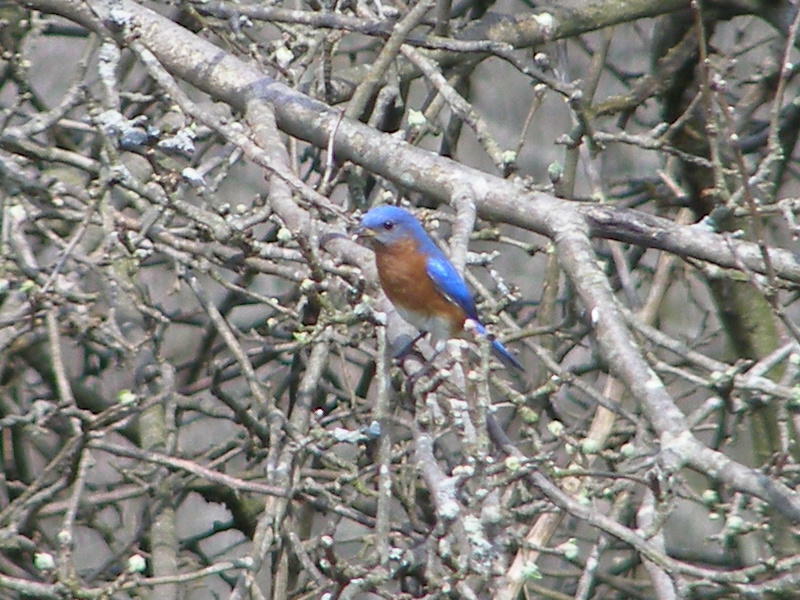 When the Bluebird finally took to the air, the two halves went in different directions. 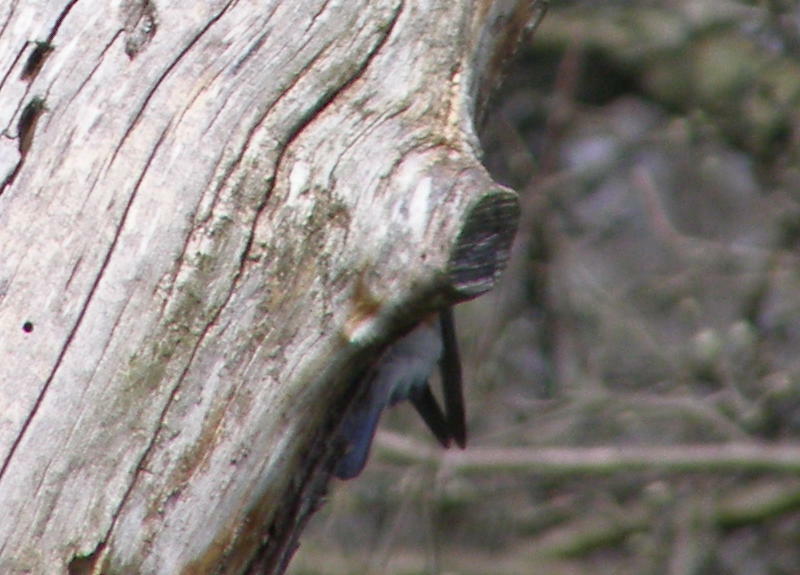 Even though current evidence suggests that my earlier photo was in fact showing parts of two different birds, I’m not yet ready to abandon the idea that there may be a super long Bluebird at Blue Jay Barrens. It’s entirely possible that there were two normal Bluebirds hidden from my sight and that these two birds flew just as my long bird slithered away down the tree trunk. 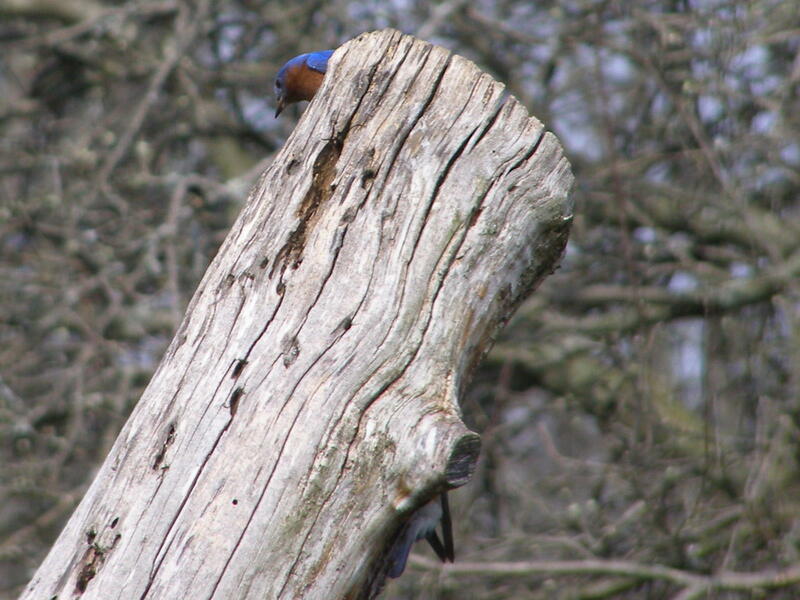 I’ll be keeping watch for stretched Bluebirds from now on. 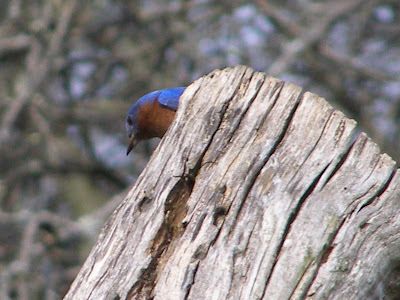 A pair of normally proportioned Bluebirds has taken up residence in the hole that was earlier excavated by the Red-belliedWoodpecker. It’ll be fun to have these birds nesting so close to the house. I just wish I could turn the tree around a bit, so the nest hole would be visible from the window. It’s the middle of March and I’ve already had my second snake encounter. I hope this means that 2012 is shaping up to be the year of the snakes. 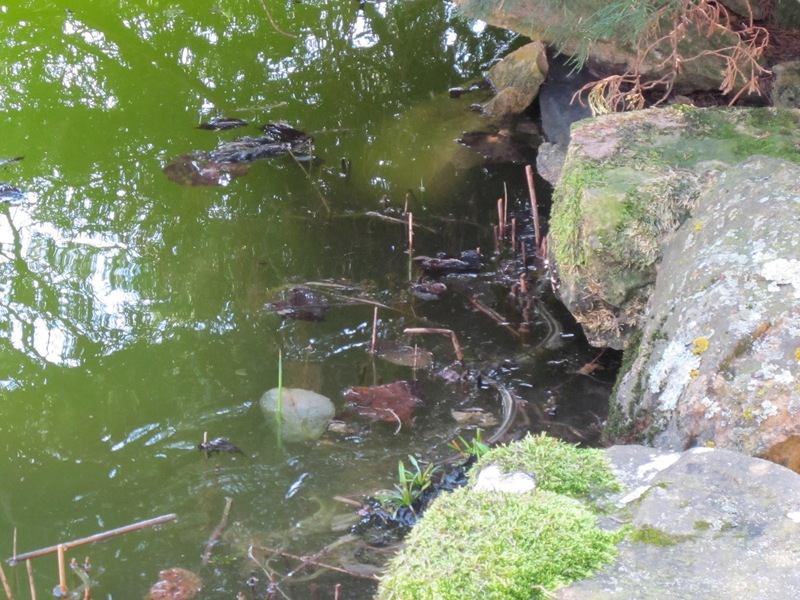 I was working around the front of the house when I heard the frightened squawk of a Green Frog followed by a splash in the Water Garden. I peaked around the corner of the house to see what was going on and immediately spied the answer. 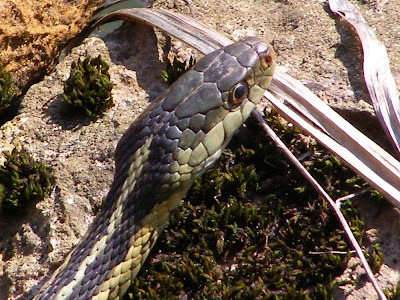 One frog startled by one very pretty Garter Snake. I think the frog was a bit larger than the snake could have handled, but I guess the safest course is always to run away. One of my reasons for having a Water Garden outside the front door is to increase my chances of viewing interesting wildlife. So far I’ve had four species of snakes attracted to this area. I believe that to be a positive experience, but many people claim that attracting snakes is a reason for NOT having a Water Garden near your house. I don’t argue the point. I just think that those people are a little bit odd. 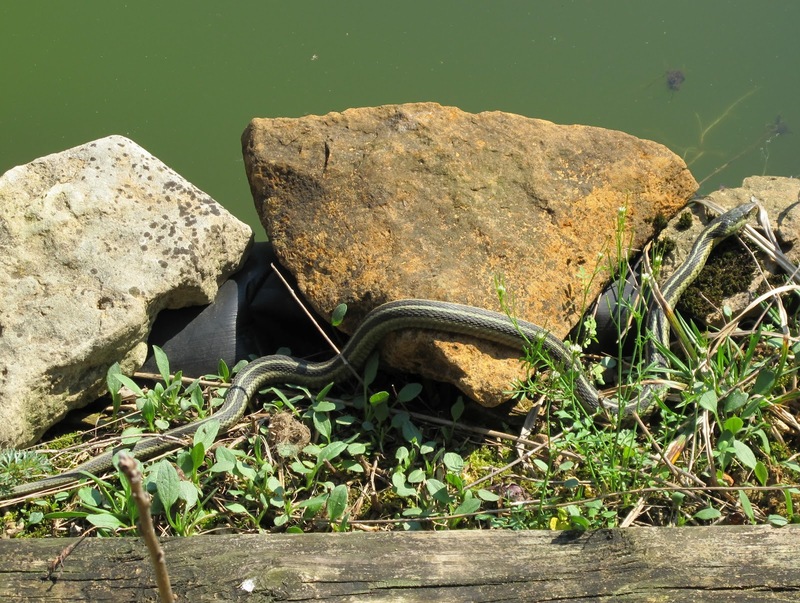 I eventually crowded the snake and it took to the water to hide. 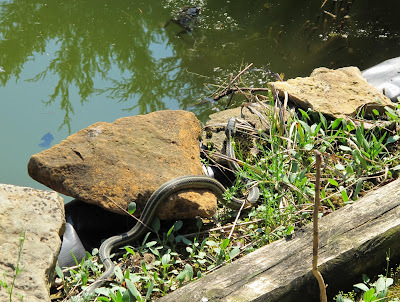 I’m sure it will stay around, but as the plants around the Water Garden get taller, the snakes will be harder to see. Those same people with odd ideas about Water Gardens outside the door also advise me that it’s not wise to allow thick, weedy growth up near the house. I then point out how fortunate it is that none of those plants are weeds.